HONOLULU, Nov. 28, 2018 /PRNewswire/ -- Matson, Inc. (NYSE: MATX), a leading U.S. carrier in the Pacific, today welcomed the first of four new ships being built for Matson that will be introduced in its Hawaii service over the next two years. Named in honor of Hawaii's late senior U.S. Senator, the Daniel K. Inouye is the largest containership ever built in the United States. Weighing in at over 51,400 metric tons, the 850-foot long, 3,600 TEU* vessel is Matson's largest ship and also its fastest, with a top speed in excess of 23 knots. The arrival of Daniel K. Inouye also marks the beginning of a nearly $1 billion investment by Matson in its Hawaii service over the next few years, with the four new ships completing a renewal of its Hawaii fleet, and a terminal expansion and modernization project at its Sand Island facility in Honolulu. All four new vessels have been designed by Matson specifically for its Hawaii service and incorporate a number of "green ship technology" features that will help protect the environment, including a more fuel efficient hull design, dual fuel engines that can be adapted to use liquefied natural gas (LNG), environmentally safe double hull fuel tanks and fresh water ballast systems. "These new ships are the future for Hawaii shipping and will bring a new level of efficiency and reliability to our service," said Matt Cox, chairman and chief executive officer. "The substantial investment in new technology underscores Matson's long-term commitment to Hawaii and our desire to serve the Islands in the most advanced, environmentally friendly way for years to come." For images or video of the arrival of Daniel K. Inouye, please contact Emily Latimer at elatimer@mvnp.com or (808) 780-2820. 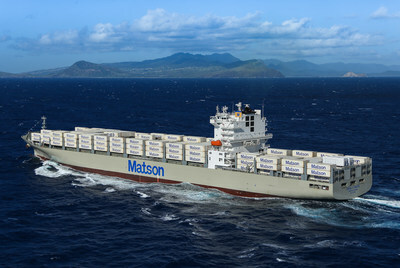 More information on Daniel K. Inouye and Matson's fleet modernization program is available at www.Matson.com .